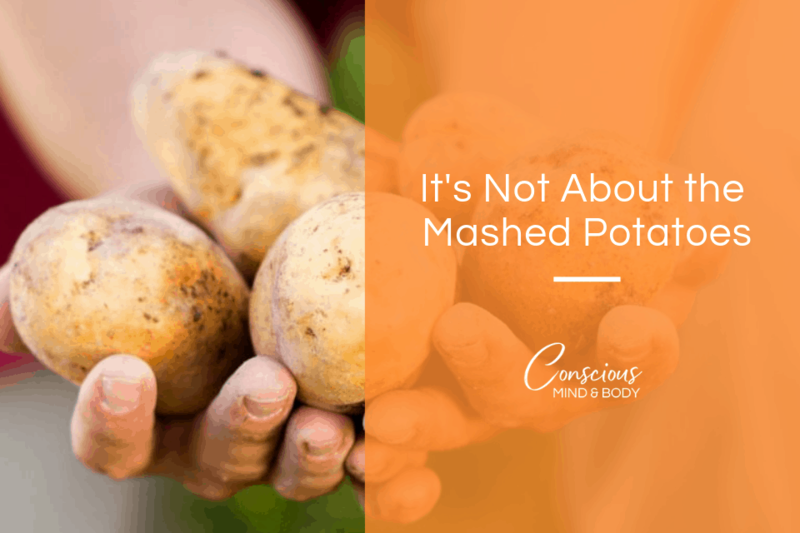 It’s not about the mashed potatoes. It’s not about the mashed potatoes or the pie or the rolls or the whatever you enjoy eating. It’s not about emotional eating. It’s not about stress. It’s not about feeling too full. It’s not about being hungry. It’s not about exercising away the calories. It’s not about being bad. It’s not about being unworthy. It’s not about your childhood. It’s not about your poor choices. It’s not about your lack of control. It’s not about willpower. It’s not about finding the reason why. It’s not about wishing and hoping. It’s not about waiting to be rescued. It’s not about rewriting history. It’s not about your successes. It’s not about your failures. It’s not about your any of these things. And definitely, it’s not about the mashed potatoes. It’s about stepping consciously, fully into your life and taking the risk to be different. You can keep doing what you’re doing if that is what you want to do. Many people choose this path. It’s safe. The big question for you to answer is does staying the same cost you your happiness? What else is there that really matters? Life is too short to have your enjoyment of it conformed to another’s idea of happiness. You have to create your life in the way that you need it to be. It’s great to get inspiration from others and after that, make your life your own. Follow your own path and do what works for you. You have to be good with you. You live with yourself in your head 24/7. What’s it like in there? Is it a place you would welcome others to come in for a visit? Is it a place you want to dwell in for the rest of your life? You can listen to the latest fad diet or friend who’s selling the latest diet supplements or the magazine that grabbed your attention while you wait in line to purchase your latest goodies for your next emotional eating episode. Sensible advice is lost when you’re desperate for change and unwilling to patiently settle into self-awareness. Just think, if you allowed yourself to become more self-aware would you be further along than if you chased the latest fad? Listening to your own voice is lonely. Others in your life might not like it. It might mean that they will need to adjust and get used to a more vocal, more honest you. There will be lots of people who outright disagree with you. There are people who will see the changes as a way to convince you to follow them. You need to stay the course. As long as your path is one of health, self-compassion and doing what’s right, you’re good. Are there dreams you want to become reality, but you’re scared? What if you make your dreams a reality and you develop the skills you need to enjoy success? Think about how you feel when you’ve earned something rather than being gifted it. Usually people say that their sense of self changes. Every time you learn something new you are creating a new addition to your self-knowledge. This is precious. What if the challenges and pain of the journey make you stronger? What if you learn more about yourself along the way? What if you start believing that you can trust yourself, including your body? What if you listen to your body and trust that listening will give you the information you need? Sometimes we need good information, but most of the time all you need to know is yourself. An intimate knowledge of how your body works free from the assumptions, judgments, someone else’s rules, etc. Instead, be curious, experiment and then pay attention to what happens. Do more of what works. That’s the bottom line. What if you have the resources to know what you need right at your fingertips? What will it take for you to listen to yourself and get started? Get started. Start making the changes you want to see happen in your life today. It’s all you’ve got in the end. Do what you need to do to be healthier, happier and more connected to what you most want in your life today. It’s not really about the food or what you weigh or how you look or how many lines are on your face or much cellulite you have or don’t. These aren’t markers of your value as a human being. These things don’t elevate you to some false superiority and valuing them keep you locked in a battle that you’re never going to win. There’s always someone more this or that than you. Stop playing that game and step into the fullness of your life. Because, in the end, it’s not about the mashed potatoes.